“If I was all-powerful, what would I do?” Have you asked yourself that question? Just try to imagine the possibilities. Well, Jesus was all-powerful. And, on Thursday night of Holy Week, what did he do with that power? He used it to wash his disciples’ feet. Washing feet was the job for the most menial servant. It was an unpleasant job. In Jesus’ day, people walked on roads which were dusty or muddy. And, remember that animals also traveled on those roads, leaving behind their, well, you know. So foot-washing was a nasty job! Jesus was willing to do that nasty job. Even though he is all-powerful, he chose to set aside his power and his rights so he could serve. As Jesus’ followers, he calls on us to have the same servant-like attitude. He calls on us to put the needs of others before our own—the needs of our spouse, our children, our parents, our friends, our co-workers. And when we fail, Jesus tells us to look to him for forgiveness. After all, he promises to give his followers credit for his perfectly loving life. And, in exchange, he took our perfectly sinful lives to the cross. So now, in God’s eyes, we are perfectly loving servants. Let’s live that way. May Jesus’ willingness to serve us perfectly move us to serve others just as willingly and selflessly. Lord Jesus, thank You for serving me! Fill my heart with gratitude and open my eyes to opportunities to serve others this day, even as you served me. Amen. Are you a controller? It seems that most people like to be in control of the situations around them, or at least think they are in control. On Tuesday of Holy Week the chief priests and elders of the people thought they were in control. They schemed to arrest Jesus and kill him. They would wait until after the Passover festival. But, eventually, they were sure, they would get rid of him. But who was really in control? It wasn’t the chief priests and elders. It was Jesus! Even as the chief priests and elders made their plans to arrest and kill Jesus after the Passover, Jesus was telling his disciples that it would happen during the Passover. Who was in charge? Jesus was! And so he remains in charge today. True, we often question his control and even fight against his control. But, thankfully, God’s control doesn’t depend on how well we follow him. God remains in control whether we willingly bow to his control or fight tooth and nail against it. Knowing that Jesus was in control of the Holy Week events makes them all the more beautiful, because it reminds us that he was doing all this willingly, because he loved us! Thank God that Jesus was in control then, and that he is still in control today. O Savior, forgive me for questioning your control. Assure me that you are ruling all things for the good of all of your people, including me. Amen. During this Holy Week, we are going to “walk” with Jesus in our daily devotions. Each day we will consider something Jesus said or did on that day of Holy Week. So, today’s event took place on Monday. The day before, Jesus had been hungry, and he looked for figs on a particular fig tree. Finding none, Jesus had said, “May you never bear fruit again.” Only one day later, the fig tree was withered! Jesus was using the fig tree to illustrate an important, and sobering, reality. Those who refuse to live for the Lord, who fail to produce spiritual fruit, will eventually fall under his judgment. How do we avoid falling under that judgment? Jesus’ response to Peter helps us. He told Peter to, “Have faith in God.” In other words, this event was meant to cement and encourage trust in the hearts of the disciples. How? They heard Jesus speak. Then, they saw that his words came true. And so it will always be! When Jesus speaks, you can be sure that it will happen. When he says, “God so loved the world,” you can be sure it’s true. When he says that baptism saves, you can be sure it’s true! When he says that he’s preparing a place for you in heaven, you can be sure it’s true! When he says that he is with you always, you can be sure it’s true. “But, I can’t (always) see it! I can’t always tell it’s happening!” True, we can’t always see that Jesus is keeping his Word. But, when we remember how the fig tree on the road to Jerusalem withered, just as Jesus said, we can be sure everything else will happen just as he said. O Savior, open my ears to hear your Words. Then convince my heart that Your promises are true! Amen. XW E L C O M E T O O U R C H U R C H X We extend a warm welcome to everyone today, especially our visitors. In the bulletin you’ll find an outline of today’s service, a calendar of events and other bits of information. In the red hymn book you’ll find the songs we sing and the order of service that we follow. If you would like a large print hymnal or bulletin please ask one of our ushers and they will gladly assist you. Restrooms and nursery area are located the parish hall at Emmanuel and in the lower level and link-way at St. John’s. It’s nice to have you visit today. “Let us not give up meeting together, as some are in the habit of doing, but let us encourage one another–and all the more, as you see the day approaching” (Hebrews 10:25). Welcome to God’s house! May God bless our worship together. 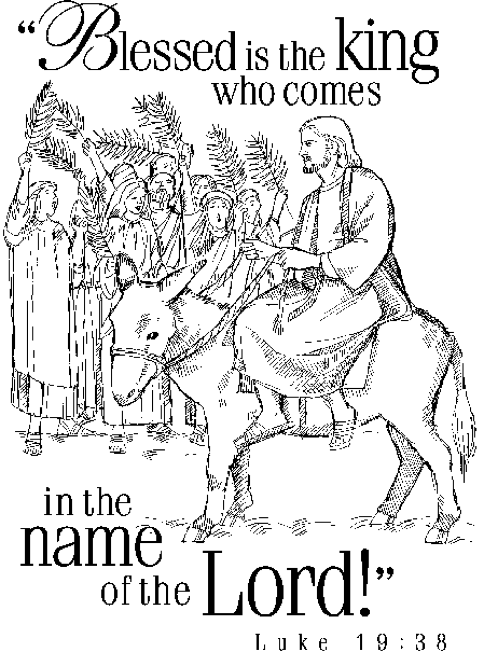 G O D ’ S W O R D F O R T O D A Y Jesus Is Our King and Lord of All – Palm Sunday gets its name from the palm branches that people spread to make a path of victory for Jesus as he entered Jerusalem. There he would gain a victory they did not expect. The victory over sin and death, won for us by his own suffering and death. On Palm Sunday, the crowd hailed Jesus as king. Yet Jesus cried on his way down the Mount of Olives on the donkey, because Jerusalem did not recognize God’s coming to them. Bottom line: Jesus is more than the crowds knew. He is Lord of all. He is King of the world. He wore a crown of thorns for us and for all people. Praise his name forever! P: Blessed is the one who comes in the name of God! C: Hosanna in the highest. P: Lift up your head, O gates! and be lifted up, O ancient doors! C: That the King of glory may come in! P: Who is the King of glory? C: The Lord of hosts is the King of glory! P: In the name of the Father and of the Son + and of the Holy Spirit. P: As we follow Jesus down the road, through the gate and into the holy city of Jerusalem, we are reminded that it is our sin that has put him on this path. C: Most merciful God, you sent your one and only Son Jesus to pay the price for our sin. Instead of glorifying him, we glorify ourselves through our selfishness and the idols we create and worship. Instead of walking with Jesus, we walk away from him. We are sinful in thought, word, and deed. By our evil action and inaction, we lock the door to the future. But by his life, death, and resurrection Jesus opens it again for us. Forgive us, Lord. Renew us and restore us that we would live to your glory, love you, and serve our neighbor. P: The very purpose of Jesus’ triumphal entry into Jerusalem was to make his way to the sorrow, pain, and suffering of the cross. By his perfect life and death your sins have been forgiven and you have been redeemed. Jesus flings wide open the door to eternal life for you. Therefore, I forgive you all your sins in the name of the Father and of the Son and of the Holy Spirit. P: We praise you, O God, for the great acts of love by which you have redeemed us through your Son, Jesus Christ. As he was acclaimed by those who scattered their garments and branches of palm in his path, so may we always hail him as our King and follow him with perfect confidence; who lives and reigns with you and the Holy Spirit, one God now and forever. 9Rejoice greatly, Daughter Zion! Shout, Daughter Jerusalem! See, your king comes to you, righteous and victorious, lowly and riding on a donkey, on a colt, the foal of a donkey. 10I will take away the chariots from Ephraim and the warhorses from Jerusalem, and the battle bow will be broken. He will proclaim peace to the nations. His rule will extend from sea to sea and from the River to the ends of the earth. We will sing the refrain and read the verse in unison. he will receive blessing from God his Savior. The LORD Almighty—he is the King of glory. 5In your relationships with one another, have the same mindset as Christ Jesus: 6Who, being in very nature God, did not consider equality with God something to be used to his own advantage; 7rather, he made himself nothing by taking the very nature of a servant, being made in human likeness. 8And being found in appearance as a man, he humbled himself by becoming obedient to death- even death on a cross! 9Therefore God exalted him to the highest place and gave him the name that is above every name, 10that at the name of Jesus every knee should bow, in heaven and on earth and under the earth, 11and every tongue acknowledge that Jesus Christ is LORD, to the glory of God the Father. During offering, please greet one another and sign the worship register in each pew. P: O God, our heavenly Father, we come before you with thanksgiving and joy. In your great mercy, you sent your one and only Son—a King—to share our humanity and to unveil the mystery of your saving will from all eternity. O Lord Jesus Christ, Lamb of God, in you shines the light of life, yet you became obedient to death, even death on a cross. Lead us to see the depth of your love and the fullness of your forgiveness. Our Father, who art in heaven, hallowed be thy name, thy kingdom come, thy will be done on earth as it is in heaven. Give us this day our daily bread; and forgive us our trespasses, as we forgive those who trespass against us; and lead us not into temptation, but deliver us from evil, for thine is the kingdom and the power and the glory forever and ever. Amen. At St. John’s Ev. Lutheran Church we practice closed Communion. If you are a guest at worship today and interested in receiving the Lord’s Supper, please speak with the pastor prior to the service. P: The Lord bless you and keep you. The Lord look on you with favor and give you peace. 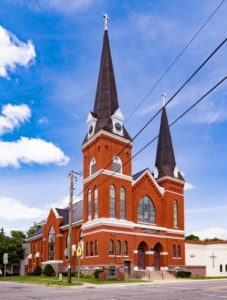 MEMORIALS From friends and family of Frieda Otto: Emmanuel has received $575.00 designated for the new Hymnal Project, and $10.00 for the New Roof Project. Thank you! PLEASE BE RESPECTFUL of your fellow worshipers preparing their hearts for worship. If you are visiting with others, please keep your voices down. Thank you! EMMANUEL EASTER BREAKFAST April 21 following the 8:00 AM Easter service, everyone is invited (members, friends and guests) for pancakes, scrambled eggs, sausages, ham and fruit. A Freewill Offering will be taken for Emmanuel’s Education Fund. The breakfast is supported by a Thrivent Action Team Project. Join us for food and fellowship in the Parish Hall. USHER AND GREETER SCHEDULE If you are signed up to be a St. John’s usher and/or greeter, please pick up your April-May hard copy in St. John’s Information Room. Schedules will be available for pick up every 2 months. NEW ACTS BIBLE STUDY After completing our Study of Matthew recently, our Monday 7:30pm & Wednesday 10am Adult Bible Class members & I began our study of the book of Acts making use of the Acts DVD–“the only dramatization using the actual scriptures…word for word from the New International Version.” Join us in the SJ conference room! NEW MEMBERSHIP CLASS begins in 2 weeks, Sunday 4/28 11:15am at St. John’s. Join us in the link-way conference room for an hour or so after the 10am SJ worship service. If you ask members about the reason why we worship, the various answers include “praising God, giving thanks, and singing and praying together.” It is true that all these things happen during worship, but are they really the purpose of worship? As Lutherans, we know that we “cannot by our own thinking or choosing believe in Jesus Christ or come to him.” Faith, forgiveness, and the sacraments are all received. Worship is primarily God serving his people with Word and Sacrament. Simply put, God gives, we receive. Christian worship enables people to receive the riches of Christ. What does Christian worship look like? Well, that depends! In churches it includes hymns and liturgies, lessons and creeds. In school it can include Bible-based action songs and murals on the walls. Understanding worship’s purpose will help us understand our various worship practices. “But I want to feel closer to God. I need emotion.” It’s true, we often feel emotion when we worship. (O Lord my God, when I in awesome wonder…” CW 256:1) These human emotions, however, are not the purpose of worship. Rather, they spring from the heart of worship: the Gospel. It is hard to find the right balance of church doctrine and expressive worship. In our defense of solid doctrine, it is easy to forget that God created us with human emotions. If we want more expressive worship, it becomes easy to downplay the importance of correct teaching. If worship is my primary opportunity to receive the riches of Christ and to proclaim the Gospel to my neighbor, then, in Christian love, I need to put aside my personal preferences and focus on my neighbor’s interests above my own. Satan knows that if he can confuse the purpose of worship, he will get us to take our focus off of Christ and to place it on our emotion or our reaction to Christ. Instead of a purpose-driven church, or a mission- minded church, let us strive to be a Christ-centered church! Everything else flows from there. We gather in worship for a very specific purpose; to receive the riches of Christ! To God be the glory! The teachers of the law and the chief priests looked for a way to arrest him immediately, because they knew he had spoken this parable against them. But they were afraid of the people. It is strange and sad that the very people who should have rejoiced the most in Jesus’ coming were the ones who became his bitterest enemies. The religious leaders of Jesus’ day sought to silence him. The hardness of their hearts became even more apparent after Jesus used a parable to uncover their unfaithfulness to God. The only thing which prevented them from arresting Jesus was the crowd of people who listened attentively. Sadly, like those religious leaders, we do not always want to listen to what Jesus has to say. We don’t always appreciate the guilt of our sin being uncovered. There is a part of us that bristles with anger at his accusations. We want to silence Jesus’ criticism and correction. While we don’t always like the truth, we need to hear it. We need to understand we are sinners and recognize that, without Jesus, we would be under God’s just judgment. Only when we recognize these things are, we ready to hear the good news of his forgiveness. And when we do, this precious message of God’s undeserved love in Jesus breaks through the hardness of our hearts and brings us to trust in him. This precious message of God’s undeserved love in Jesus leads us to rejoice in his will and follow it in our lives. What a wonderful change of heart! O gracious Lord, I thank you for breaking through the hardness of my heart and bringing me to the joy of knowing you and your Son. Continue to keep my heart as your dwelling place until I join you in heaven. Amen. This digital age we live in has certainly impacted our lives both in positive and negative ways. Nearly every day, it seems, a new article is published about either the benefits or evils of social media and the internet. For example, due to the use of social media, people have fewer good friends than they used to. Instead, they have more people in their lives that might qualify as “acquaintances.” They may know more people but their relationships with people are not as deep as they once were. Have you noticed a similar trend in your spiritual life? Perhaps we are so busy that our connection to Jesus is not as strong as it once was. We so easily allow other areas of our lives to crowd out our time with Jesus. Or maybe we have convinced ourselves that we only need a casual connection to Jesus. In other words, he’s good to have around in a tight spot, but we don’t need him overly involved in our lives. This is a dangerous approach to take. St. Paul’s words in Philippians 3:10 encourage us to be more than just acquainted with Jesus. Did you notice Paul’s desire to learn more about and grow closer to Christ? He says: “I want to know Christ—yes, to know the power of his resurrection and participation in his sufferings, becoming like him in his death, and so, somehow, attaining to the resurrection from the dead” (Philippians 3:10). Paul had a desire to continue growing in his faith. He knew that Jesus is the only way to heaven and because he wanted heaven so much, Paul strove to learn more and more about him. Paul’s goal was eternal life. As you and I get to know Jesus better in his Word, he will help us reach that goal as well. Dear Jesus, so many things in life threaten to get in the way of my relationship to you. Through your Word, help me to know you more and more each day. Amen.